Peaches and Nectarines are within the scope of all to grow successfully in this Kenya, no matter where you live. The way in which you grow them can be varied according to climate, locality and position but they can be a real triumph and are generally hardier than is often realized. The Peach and Nectarine tree flowers early – second only in this respect to the Apricot – and usually opens blossom from the end of March. For this reason, some protection is advisable so that the flowers do not become frosted and if this happens you may lose some or all of your crop. As far as the winter goes well they are usually quite frost tolerant whilst dormant and only extreme or prolonged cold temperatures will harm them. Is of course the most favorable one you can afford. Soil isn’t very critical as long as it has good drainage and I haven’t found PH to be particularly important. They resent poor drainage and heavy clay soils might be problematical overwinter as the ground gets so cold and wet. Under those conditions better to grow them in containers. Dig a hole large enough to take the roots. The root system can vary quite a lot in size according to variety, Rootstock and the land the tree has been grown on as well as the age of the tree. So, don’t dig the holes in advance, wait until you have the tree and can see what you have got to work with. The tree should be planted at a depth similar to that it was set at before on the Nursery; you can usually still see the soil mark on the stem and so use this as a guide. If you can’t maybe the trunk was washed by heavy rain or whatever then sue the grafting point as your guide. The graft is often clearly to be seen as a bulge or kink in the stem not far above the roots. It may still have wax or tree sealant on it as well. This grafting point should always be kept above the soil lebel so make sure it is sitting about 2” above the soil ideally. It should never be buried. The roots themselves should always have not less than 2” of soil over them. Make sure the tree is firmed in well when you are satisfied with it, use the heel of your boot and press down repeatedly and firmly all around the circumference of the trunk. Peaches and Nectarines do not normally need much of a stake, if the position is an open one then insert a good tree stake of 48” length into the ground before planting. Tie to it with a rubber strap. Tree guards are a necessity where rabbits or deer may be a problem. 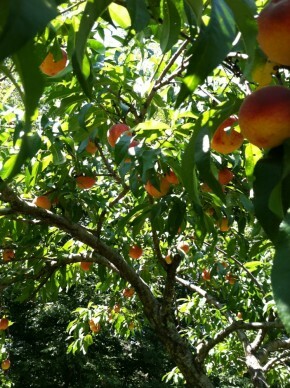 There is really only the one significant problem associated with Peach and Nectarine trees and that is Peach Leaf curl which can and will affect both Peach and Nectarine trees, but does not touch Apricots. There were effective control sprays for leaf curl but they have been removed, meaning there is only one precautionary measure available to gardeners wishing to avoid this disease. The fungal spores are spread by moisture droplets in the air. Therefore, if the tree is kept dry during the key period when these spores are active – which is very early spring just as the tree start to break dormancy – then the problem can largely be eliminated or at least reduced significantly. Bush trees of modest size, fans against a wall, and pot grown trees are fairly easily protected from rain during this essential period. Cover with a transparent material until the leaves are fully open, usually by May it can be removed and the period for infection has passed for another year. That is why trees grown in greenhouses or inside seldom get much if any leaf curl. There are no pollination issues with Peach and Nectarine at all as all varieties are self-fertile and lone trees will provide a good crop with no need for a pollinating partner. The only thing to remember is that trees grown under cover will need hand pollinating with a soft haired brush because there won’t be any flying insects around to do the job for you. Hand pollinating can also increase the yield employed outside, especially if the weather is inclement during flowering and insects may not be on the wing. This isn’t really a necessary practice unless you want to concentrate the trees energy into a lesser number of larger fruits. This of course has the effect of increased fruit size and the class of the fruit produced. It might be a consideration if your tree seems to be over producing because then you might end up with a lot of smaller fruit which may be no less enjoyable. For gorgeous big ripe fruits of peach and nectarine, remove every other fruit along the branch when about the size of an acorn, allowing the rest to develop to maximum magnificence. Remember that the tree may shed some fruits of its own accord, and this is especially true if it becomes dry at the roots during crop formation.